Gouache and watercolor, heightened with white gouache, on paper. Gift of Henry S. Morgan. Jekyll Catesby; Thomas Pennant; David Pennant; Henry S. Morgan. One of fourteen drawings and one colored proof engraving removed from Mark Catesby's "The Natural History of Carolina, Florida, and the Bahama Islands...", 2 vol., London, 1731-1743 (PML 45708-45709). 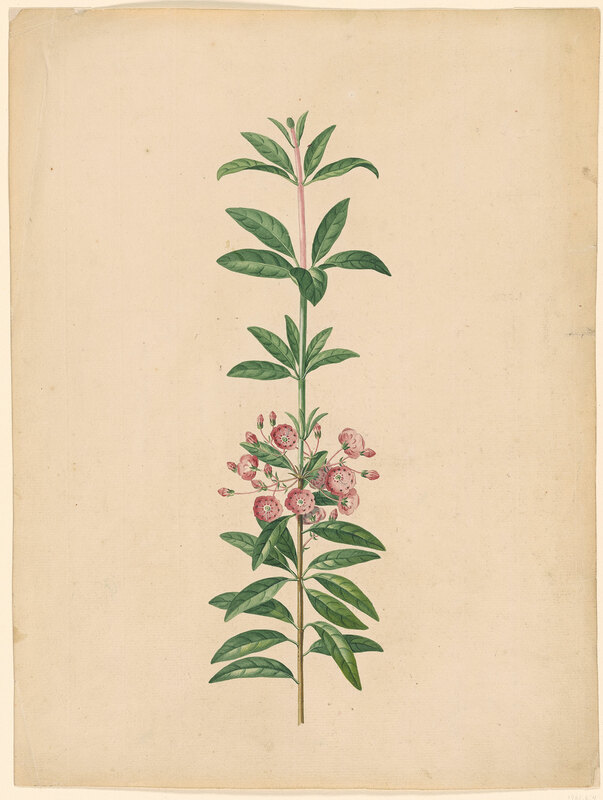 Traditionally given to Catesby, this drawing's attribution has been changed to Ehret, as proposed in 1990 by Amy Meyers, Huntington Library in San Marino, CA, who pointed to its delicate and subtle use of gouache, particularly in evident in highlights along the stem. Judith Dinent, former librarian of the Botany Library, British Museum (Natural History), concurred with her attribution (note in departmental file). Henrietta Ryan of The Royal Collection Trust at Windsor, also noted its similarity with Ehret's etching of the plant reproduced in Trew's Plantae Selectae, 1750, tab. XXXVIII (departmental correspondence, 14 August 1996).